Sir John Halberd is found dead in the Serpentine Lake in Hyde Park, London. Thomas Pitt, head of Special Branch, is called to see Queen Victoria who directs him to learn the details of this man’s death. Although Special Branch does not normally deal with obvious police problems, when the queen calls, nothing is obvious. Thomas Pitt’s history with law enforcement and his discreet behavior make him a logical choice to answer the queen’s summons. 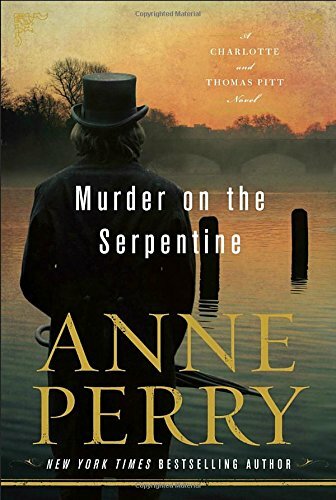 And thus starts the current Anne Perry mystery with her popular characters, Thomas and Charlotte Pitt. A creative couple when it comes to resolving criminal problems, this one is different because of the need for discretion. Thomas realizes he cannot include Charlotte in this case and that is disturbing, indeed. Charlotte, being the perceptive woman she is, realizes something deep is happening and she begins to dig into the problem. Once Charlotte has wheedled the name of John Halberd from her husband, and knows the public explanation of his death, she quickly determines that regardless of Thomas’s reluctance to share his goal, she will hunt for reasons for the man’s death through her social connections. Perry is skilled at character development and shows the various levels of society through the eyes of her characters. No two are the same and this is one of the strengths of her story. It should be noted that in previous Pitt novels, Perry developed Charlotte’s character with a sense of quality in helping her husband. In this story, Charlotte comes across as a snoopy little wife who is running around behind her husband’s back to help him solve this puzzle in spite of his desire to keep her away from it. With the help of her sister, Emily, Charlotte discovers that Sir John’s death was perhaps not the simple accident it was reported; that there are vague facts surrounding the event. In Emily’s social circle, Charlotte meets Walter and Felicia Whyte; Alan and Delia Kendrick; and a variety of other upper class socialites who may each play a role in Sir John’s demise. As Thomas pursues his investigation from another direction, additional facts begin to surface indicating that bigger international events may be at the basis of his death and the finger starts to point to one of the socially elite. As Thomas determines unequivocally that Sir John’s death was the result of murder, not accident, the facts that surface focus directly toward Alan Kendrick. Kendrick is a close confidante of the Prince of Wales, and that presents a major impediment to Thomas’s investigation. As Charlotte and Thomas both work the case from opposite ends of the spectrum, their discoveries bring them closer to the answer. It is not until the death, an apparent suicide, of Delia Kendrick, that both parties bring their facts together to learn the truth of both deaths and who was responsible for them. Again, Charlotte agonizes over what role she may have played in this event that she had no control over. The situation that opens the story—the death of Sir John Halberd and the summons by the Queen to involve Thomas Pitt—is a strong one. As the story progresses, it becomes a bit muddled and the end of the story disparages Thomas’s character. Perhaps Perry is setting the stage for additional Thomas and Charlotte Pitt stories, but the ending to this one feels forced and is a bit too convenient. The international event that is thrown into the mix as the story progresses feels like it was tossed in just to give some additional interest to the events of the era. Perry gives away the murderer early in the book, leaving little mystery for the reader to uncover. Although she ties up the ends of the story and leaves nothing undetected, the story is not satisfying. Perry fans will forgive her but perhaps her next effort will resurrect Thomas’s character to the high level of self-respect he is due.